The goal of Partners in Policymaking is to educate participants to be active partners with those who make policy. They will become partners in policymaking. The idea is to develop partnerships that are based on positive relationships. In today’s political climate of radical change, Partners graduates must work harder than ever to prevent the loss of basic rights for people with disabilities. Partners graduates can change the future by influencing public policy today. The conversion of the Partners program to an e-learning site gives Partners participants the opportunity to supplement their learning; Partners graduates can refresh their skills and stay current on best practices; and others can increase their knowledge and understanding of best practices in the disability field, and learn how to communicate effectively with their elected officials. This seven-hour self-directed e-learning course has been created to help people with developmental disabilities, their parents, family members and friends, educators and service providers understand the important concepts of self-determination, family support, community living and assistive technology. The course focuses on helping people with developmental disabilities, their family and friends explore these four important elements that, together, can help them create a meaningful life that is independent, inclusive, productive, self-determined and integrated. NEW! Partners in Living is now available in Spanish. 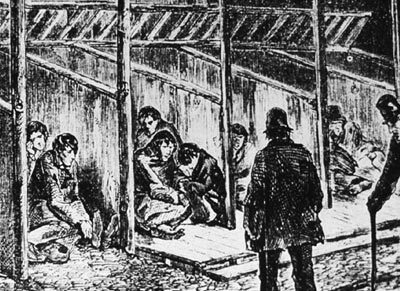 This eight-hour self-study was created to help people with developmental disabilities, their parents, family members and friends, educators and service providers understand the history of society’s treatment of people with disabilities from ancient times through the present. 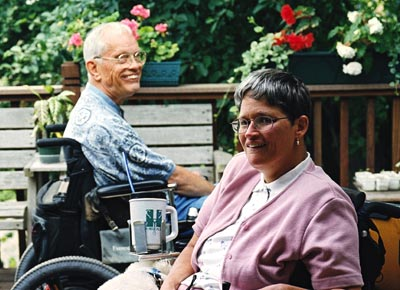 The course focuses on the way that people with disabilities lived, learned and worked throughout history and growth of the Disability Rights Movement. The course also introduces some of the individuals and groups whose efforts resulted in new ways of thinking about people with disabilities and their rights. This three-hour self-directed course was created to help parents of children with developmental disabilities understand and maximize the special education system. The course focuses on a child’s right to a free appropriate public education, the laws that protect those rights and offers practical ways that parents can ensure that their children benefit from an inclusive education. The course reviews IDEA 2004 and includes current thinking on educational reform and the importance of teaching children to use digital technology to improve educational outcomes and better prepare children to work in the future. This three-hour self-study course is designed to help people with disabilities and their families create positive change through advocacy. The course helps participants understand the legislative process, the essential elements of good advocacy, identify and research personal issues, then advocate for systems change as individuals and as part of larger community efforts. The course includes opportunities to put what has been learned into practice through a series of interactive exercises. 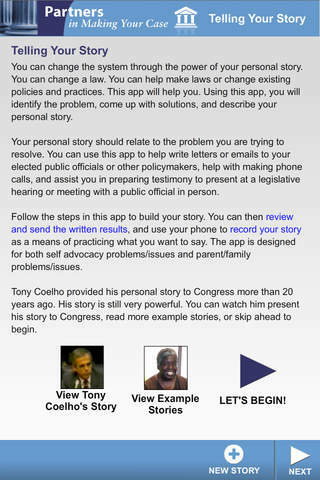 The app, “Telling Your Story,” helps you create and practice your personal story with tips on how to best present yourself, to help inform and educate your elected public officials about issues that are important to you. An American Sign Language version is also available and can be accessed directly at http://www.mncdhh.org/makingyourcase. Funding for this version was provided through the Telecommunications Access Fund, Minnesota Department of Commerce. Adaptations were made to best meet the needs of individuals who are deaf, deafblind, or hard of hearing. An EZ Read version of the Partners in Employment online course is now available and can be accessed at www.mn.gov/mnddc/pipm/employment-ez. This version contains the same information as the regular course along with exercises and exams but uses icons (visuals) to help the reviewer understand concepts and facilitate the learning process. In order to track your progress through the courses and qualify you for a completion certificate, you'll need to log in with a user account. If you're already registered, log in below, otherwise register and create a new user account, Registration is free. You'll only need to register one time to have access to all the courses on this site on any computer or device. View and edit your User Profile, including changing your password.